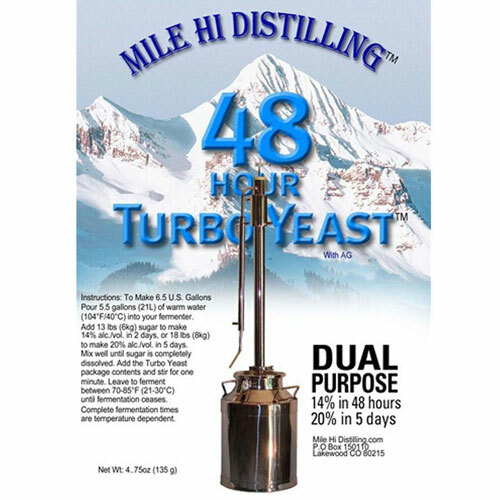 Worlds best 48 hour turbo yeast from Mile Hi Distilling your one stop shop for distilling products. 48-hour turbo yeast with AG is a Dual purpose yeast that can make. 14% ABV in 48 hours or 20% ABV in 5 days. 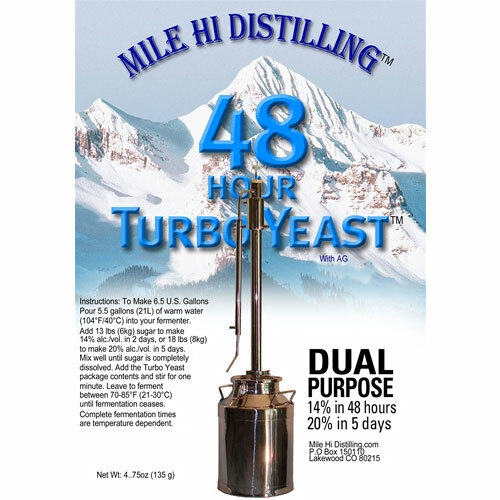 The 48-Hour Turbo is specially formulated for a pure fermentation, and produces very little volatiles so it makes a very nice wash for distilling. FRESH in from Sweden. 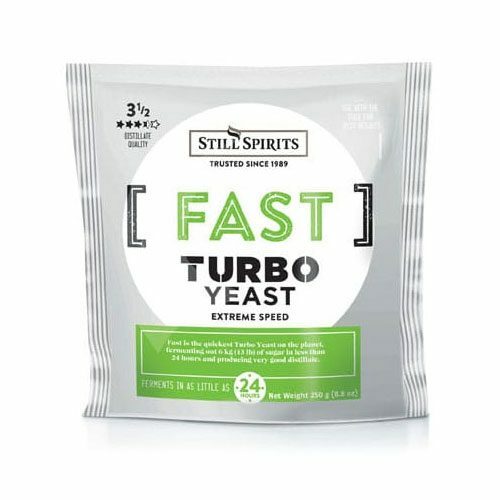 The most advanced 48-hour turbo yeast in the world. 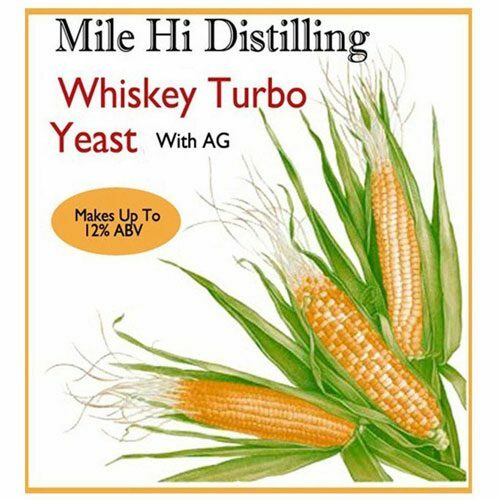 Mile Hi only sells fresh turbo yeast for all you distilling needs from whiskey to vodka yeast. Other company’s sell this same 48 hour turbo yeast for about $5.00 but we buy in bulk to save you money. 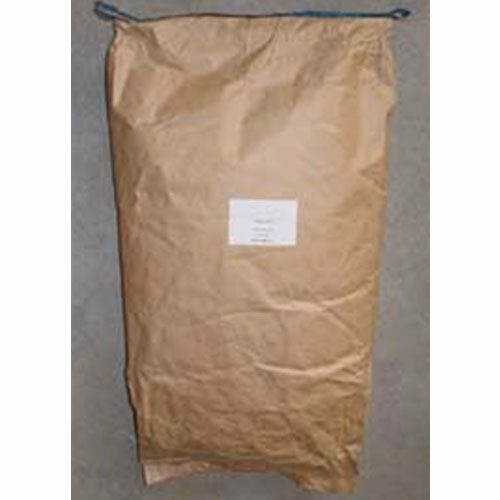 We also sell the same turbo yeast in bulk to save you even more money. If buying in bulk just keep in a cool place and should give it about 1 year self life. Also remember yeast will not just magically die off it could loss a little activity and take longer to ferment but even sitting for over a year it should be fine. Within 1/2 hour of closing the lid on the mash bucket, the fermentation lock was bubbling and hasn’t stopped yet. We’re looking for the 5-7 day s before we start to distill, and thus far it’s looking superb! Always works well. I usually let it work for 2-3 weeks. 5-7 days if you follow package directions. When used with a clarifying agent it produces a good neutral spirit with no off flavors. I have used this product several times and have had fantastic results I will continue to use it. I have used this product for over 10 years. Consistent quality, consistent performance. Easy to use with great results. Pour it in, stir it up, and let the turbo yeast do the rest. Works great. High yield on proof. Clears really well. I have had excellent results with this yeast. You can’t beat the price..
for me ,it works best if let go for a week. I’ve used this yeast many times and always have great luck. I also use their 2-stage clearing agent and turns out a very good product. 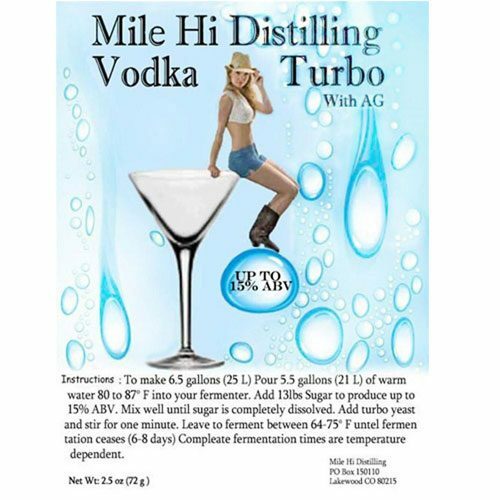 I use a column still and then filter with Mile Hi filter unit have fantastic clear, odorless, tasteless, high proof spirit that we add essence or oak chips to. I’ll use this again and again. When I don’t have time to wait This is my go to. Pure awesomeness in a bag! Great yeast, always works well. Only complaint is it smells a little like rotten eggs during the fermentation process. Other than that worth every penny. One of the best turbo yeast on the market!! Starts working in about an hour, around the three hour mark it’s blowing the water out of the air lock!! 7-8 days it’s done, consistantly produces 20% alcohol by volume. My 8 gallon can with 2″ reflux tower with 110 volt 2200W heating element, two copper packing and rashing rings will produce 1-1/4 to 1-1/2 gallons of 186 proof whisky from 8 gallons of wash…..simply fantastic!!! Awesome yeast! This stuff performs like no other and I have tried many different kinds. No off flavors and produces 20% alcohol every time. The instructions are kind of off. just be sure to add yeast when temperature of sugar water is below 80F and above 70F and it will work great. At first you will need hot water to dissolve the sugar just make sure the temp of the sugar water is below 80F before adding yeast or the high temp will kill the yeast. Thanks Mile High for a great price on a superior yeast. I have been using this yeast for years now with very good results. When I still off a batch using this yeast. I pour a test batch into my 250 Ml beaker then I put my hydrometer in and it usually reads 90 to 92% . That is leaving the wash to do it’s stuff for 10 days. This stuff works great and I always get 20% yield.